When I got to work this morning I was greeted outside by a barefoot, pajama clad very-nearly-three-year-old who very eagerly asked if we could put up Halloween decorations. Her mom had purchased them about a week ago, and this little girl was dying to display them. So with the help of her five year old sister we set to work in the little amount of time we had before we walked to school. We hung cobwebs up outside, which the girls thought was the coolest thing ever, and then after dropping off the older one at school, started putting up a few things inside. 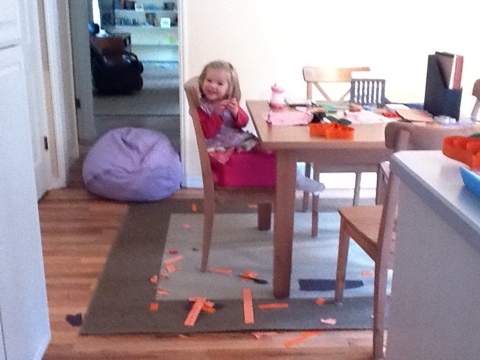 Eventually E. decided she wanted to make an art project, so while she worked on her own creation I cut out the paper for pumpkins. I love using Google’s Image search engine to find art and craft ideas for the girls. 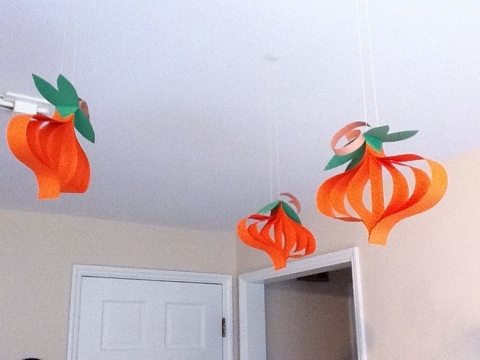 One of the first images to pop up was these adorable hanging pumpkins. Here’s the link. Before we were done the room looked like this. But we ended up with these. I just wanted to share in case anyone is looking for a quick and easy Halloween/autumn decoration to make with kids! Those pumpkins are wonderful! I bet both girls are not only excited about Halloween but thrilled with the decorations.